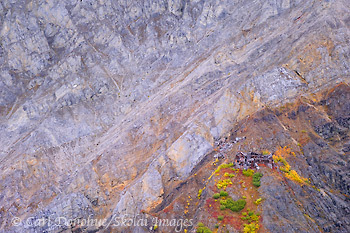 Erie Mine Bunkhouse and fall colors, Kennecott Mines, Wrangell - St. Elias National Park, Alaska. Erie Mine, Wrangell – St. Elias National Park, Alaska. Erie Mine Bunkhouse and the Wrangell Mountains, fall colors. Erie Mine is one of three mines that made up the famous Kennecott Copper Mines, Kennicott, Wrangell - St. Elias National Park and Preserve, Alaska. Please click on the image above to view a larger version of this photo. From the aerial shoot we did in September; this one is of the old bunkhouse at Erie Mine, one of the 3 Kennecott Mines, in Wrangell – St. Elias National Park. It’s interesting to me how much money, time and investment the National Park Service put into Kennecott, an old abandoned Copper Mine. The basic tenant of the Park Service is “don’t take stuff out of the place, and don’t leave your trash behind”. It seems odd to effectively celebrate an organization that did quite the opposite of that. The mining company, like most mining companies, took what they wanted from the landscape, and left all their sh** behind when they were done. Now, what they did is revered. But, such are the ways of the NPS; sometimes they’re hard to follow. This entry was posted in Aerial Photos, Alaska, Environmental Issues, Fall, Landscapes, Musings, Wrangell - St. Elias National Park and tagged Aerial Photos, Fall, Kennecott, Landscapes, scenics, Wrangell - St. Elias National Park, Wrangell Mountains on September 23, 2011 by Carl D.
Seems no surprise that humans place human history above natural history so many times! It’s par for the course, IMO. The Copper mine ran for barely 30 years; those mountains are how many thousands of years old? The native folks of the area had lived around here for far longer than some private corporate business extracted minerals.